ZoneAlarm Free Firewall is a simple firewall application designed to protect your computer from suspicious activities and unauthorized access attempts. The tool has a functional layout and the basic firewall and application control features are enabled by default. 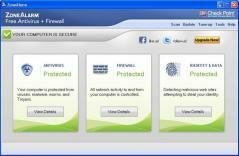 The firewall blocks unauthorized access and allows you to view monitored networks, as well as add more if needed. It also provides several advanced features such as blocking public servers, disabling the Windows Firewall and enabling VPN protocols among others. With application control, ZoneAlarm Free Firewall monitors the behavior of all running processes. It also has a learning mode, which is enabled will prompt to mark applications as safe or suspicious when activity from their part is detected. Furthermore, you can quickly customize settings using sliders, view all installed applications along with trust level and status, as well as add more programs to the list.